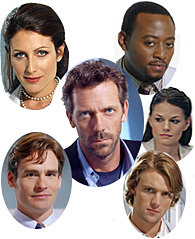 Gregory House MD (Hugh Laurie) surrounded on the left by his boss, Dr. Lisa Cuddy (Lisa Edelstein) & his friend Dr. James Wilson (Robert Sean Leonard) & on the right by Drs. Eric Foreman (Omar Epps), Allison Cameron (Jennifer Morrison) & Robert Chase (Jesse Spencer). The TV show "House M.D." — shortened to "House" — broadcast on Fox on Monday nights is a medical descendent of the Sherlock Holmes stories. Instead of criminals, the enemy is germs, diseases and other vulnerabilities of the human body, tracked down like criminals. But House isn't just derived from Holmes. The character may also have influences from other mythic characters. The stories usually follow the pattern of the scientific method: The team thinks up possibilities based on the evidence and then tests them, eliminating the ones that don't pass the tests until they come up with a theory that works. Or as Sherlock Holmes said, "When you have eliminated all which is impossible, then whatever remains, however improbable, must be the truth." Some critics have derided the plots for being formalistic, but if through interesting fiction, the writers are demonstrating how science works, there is genius in their method. The House M.D. Guide, has spoilers if you want details of what the producers and writers of the TV show have planned for the future. But you will never run into spoilers without clicking on a link to them that specifically says "Spoilers"! We also link to various reviews and articles from the press. 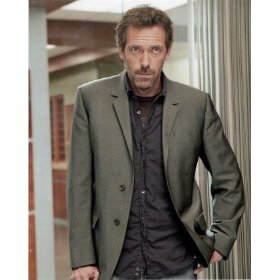 And we will have quotes from House and his team on character and episode pages. And we have information on the DVDs, books and other merchandise.